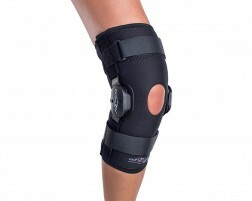 A rigid hinged knee brace can provide a maximum level of support to the knee. Hinged braces are ideal for day-to-day activities and all sports for those who are suffering from mild to moderate ligament injuries or instabilities, meniscus injuries, sprains or osteoarthritis. For severe ligament injuries or for those involved in contact sports like football or basketball, it is important to select one of the rigid hinged braces. Rigid hinged braces provide a maximum level of support and typically don't have a sleeve or wrap. Soft-hinged braces provide a moderate level of support and combine hinge support with a knee sleeve or wrap for compression. Need ACL protection or want a custom fit? Try a custom knee brace. 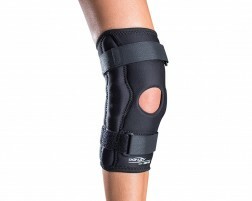 How Does a Rigid Hinged Knee Brace Work? 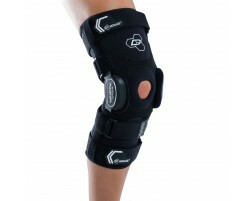 DonJoy Defiance III Custom Knee Brace - One of our best custom knee braces from our DonJoy collection. DonJoy Armor with FourcePoint Hinge - This hinge helps to prevent non-contact ACL injuries. When to Wear a Soft Hinged Knee Brace?